The problem is that the many, many varieties of leek available even to home gardeners cannot be compared simply, because they fall into classes (one academic source, writing for commercial growers, distinguishes six such classes) based on their intended seasonal growth: some are meant to be harvested early and small, others to remain in the ground for, yes, well over a full year. Try the wrong kind (or the right kind the wrong way) and you’ll likely be very disappointed. Cutting across the nice distinctions the commercial growers have to make, the chief difference between type classes is whether or not they’re intended to remain in the ground throughout the winter—that is, are they for harvest this year or next? The simplistic ”days to maturity” numbers in seed catalogues are at best crudely indicative (low day numbers, like 75 or 80, will normally mark cultivars not suitable for overwintering). 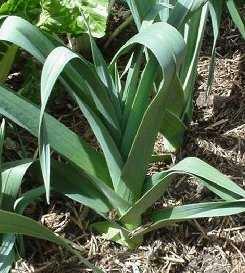 It appears from the literature that the best leeks—in size certainly, and possibly in quality—come from the overwintering varieties. Most sources recommend a type or two, but almost all end up saying or implying that every gardener should trial until satisfied. Our first concern is to find a reasonably productive class of leek—then we’ll turn to trialling types. (We do want to grow a lot, so we have opportunity.) Our plan is to try both a short-growth type for harvest in the year of planting and a long-growth type for overwintering. Once upon a time, the short-growth choice was a no-brainer: the type King Richard, still carried by almost every seed house, including those in this region and with climates like this region, and mentioned in almost every article on leeks and leek growing, far more so than any other short-growth type. But nowadays it has competition. Probably the foremost of those challengers is Lancelot. Curiously, there seems a lot of confusion over this variety: many seedsmen list it as open-pollinated, but not a few declare it a hybrid. Moreover, though most call it a short-season type, some others list days to maturity of 90 to 100, which is outside the bounds of “short” growing time. Cornell University describes it as “early season”, but hybrid; Ruthers classes it “fall/overwinter” but not as hybrid; and so on. For overwintering, the choice is, to put it genteely, much less obvious. There are kinds and there are kinds, and each has its advocates. For an example of some of the problems: Oregon State University lists the type American Flag under “Main fall varieties (August through October)”, the same category in which they place the King Richard; yet most other sources list the American Flag as an overwintering type—go figure. One source lists the type Laura at 115 days; another has it at 180 days—go figure. Yet another resource says that the American Flag is the same leek as the Giant Musselburg (which it isn’t). Why leek types (or, for that matter any vegetable types) once immensely popular just sink out of sight is unclear. Certainly in some instances the vanished types have been superseded by newer types with somehow superior qualities, but quite often it seems more a matter of fashion than anything—and often, years later, the vanished types are ”rediscovered” to much hoopla. The leek variety Durabel, for example, was said to be milder than most, but it seems no home-gardening seedsman any longer carries it; another type of great interest that has vanished from U.S. (but not U.K.) seedmen’s catalogues is the St. Victor, a “selected strain” of the famous heirloom cultivar “Blue Solaise” discussed above. Perhaps it’s the pressure from sellers of hybrid seed, who hate OP crops (because with hybrids you must buy their seed again every year). Note that the growth time of the Blue Solaise is such that it can, with care, be harvested in the same year it is planted—that is, it can but does not have to overwinter. Leeks can be direct-seeded, but the most common approach is to grow them indoors as seedlings—up to a pretty good size—then transplant. Short-season and long-season leeks need, obviously, different planting times. Leeks grow best in a cool to moderate climate, so for short-season types we sow seed in “early spring” (as the guides put it), while for long-season types (unless one wants to literally over-winter them for spring harvest) one plants at the tail end of summer for early winter harvest. In either case, we grow the seedlings for a good 6 to 8 or even 10 weeks; you will need decent-sized containers for these, as one expects them to be of some size before they’re to be transplanted. One wants to set one’s leek transplants out as soon as daytime temperatures are at least 45° F.; here, that means—depending on how conservative one wants to be about cold snaps—somewhere from the beginning to the end of March; we target March 14th (for harvest on, nominally, May 28th, assuming the commonest days to maturity listing, 75). That, in turn, means starting seedlings (if we use the full 10-week approach) as early as January 3rd! Or, if you are content with 8 or 6 weeks for seedling development, adjust accordingly. We think it best to give these plants the best shot, which means substantial, hardy seedlings; plus, it’s a great psychological start to the gardening year. We want these ready before the ground freezes hard: they can probably withstand that, but it makes digging them out a real drag. If we transplant our late leeks out on August 31st (a semi-arbitrary date) and they nominally take 110 days till maturity, we’d expect to be harvesting around December 8th. If one moves the start date forward much, it’s pretty warm; if one moves the end date down much, the ground is rather more likely to be frozen. Ya makes yer best an’ ya takes yer chances. If we go with that August 31st transplant date, and assume again 10 weeks for seeding development, we are looking at starting our seeds around June 22nd. But, again, though it’s not the commonly recommended approach, some gardeners do direct-seed their leeks. If you’re going to try that, follow the usual cool-weather-crop advice: in the spring, get the seed in “as soon as the ground can be worked” (that is, is no longer hard-frozen), usually be some time around very early March; for the fall planting, sow seed when you would otherwise start seedlings. Sow your leek seed about ¼ inch deep; if you plant in a tray or pan, allow about ¼ inch between seeds. As soon as the seedlings emerge and are large enough to handle at all, transplant them to pots or cells, recalling when selecting the peat pots that we’re going to want to grow them to a decent size before transplanting. Bigger transplants make for bigger leeks. Sow a few extra (to cull the smallest at planting-out time), and give them a rich medium and even some fertilization as they grow. Some gardeners keep the tops of growing seedlings trimmed to about three inches long, in principle to make stockier and sturdy plants for transplanting; others warn sternly against the practice. We see no harm in letting the plants do what they want to do: grow. At about the 8 to 10 week point, start hardening off the leek plants, taking a further week or two, then transplant (that will thus be at about 10-12 weeks from sowing). The informal gauge for transplanting is always “when they’re about as thick as a pencil”—by which time they might be anywhere from perhaps 8 inches tall to 18 inches tall. Take the biggest seedlings for transplanting (that’s why we seed a few extra). Leeks prefer a sunny position in light, well-drained soil, but will apparently succeed in almost any ordinary garden soil, even including heavy clay. But why challenge them? Make sure you dig the soil rather deep and well; even mix in a little sand if you have distinctly clay soil. As they grow to some depth, well and deeply spaded soil—typical of a raised or deep bed—is best, and provides, besides looseness, the aeration and drainage that they like. Moreover, they thrive on rich soil, so add in lots of organic material when preparing the ground. A pH of 6.8 to 7.0 is best, though not crucial. Space leek transplants at 6 inches in a deep-dug bed. One common method of transplanting is to dib (poke a hole in the soil with a tool called a dibber, or use the top end of a hoe or rake handle) to—recommendations vary here—3 to 8 inches deep, then place the seedlings in the holes and do not fill in the holes with soil—let soil get gradually washed in by rain or watering. Pour some water into the dibbed hole before placing the leek into it, so you don’t have to disturb the roots right away. In field experiments conducted from 1985-1987 the effects of four growing methods on the yield and quality of leeks grown from transplants was investigated. The growing methods included: 1. traditional planting at a depth of 5 cm; 2. planting as above followed by hilling up of the plants with soil; 3. planting into 15 cm deep furrows, leveled during the growing season, and 4. planting into 20 cm deep holes. In all treatments the cultivars “Alaska”, “Darkal”, “Jolant” and “Nebraska” were grown. Planting into 20 cm deep holes reduced the yield compared to the other 3 treatments which gave similar yields. Hilling up, planting into furrows and into 20 cm deep holes increased the length and weight of the blanched part of the leek shafts /stems/ compared to traditional planting at a depth of 5 cm. Laboratory work revealed that blanched shaft parts contained more dry matter and total sugars, and less vitamin C, reducing sugars and nitrates than the green ones. Length and weight of the whole shaft and of its blanched part, as well as chemical composition, were also affected by the cultivar. (In round numbers, 5 cm. = 2" ; 15 cm. = 6" ; and 20 cm. = 8".) To us, that looks like a good argument for dibbing to a depth of 5 to 6 inches and hilling up during growth. For the first 7 to 10 days after transplanting, keep the soil constantly moist, watering as frequently as required. One source says that after that period, the leeks can be left alone and nothing but a prolonged drought can harm them—they will, from thereon out, grow like weeds. Other sources say to water uniformly to maintain vigorous, uniform growth, and tender stalks. In any event, lighter soils call for more frequent water applications, but with less water given per application, than heavy ones (and vice-versa). It is a common practice to gradually hill up soil around the stalks as they grow; that forces the leaves ever higher up, leaving more of the desired stalk, and blanches the stalk (also considered desireable). Be aware, however, that such blanching, though it makes the stalks slightly more tender, also causes a material reduction of minerals and vitamins in the end product. Leeks are notoriously tedious and difficult to clean in the kitchen, owing to soil collecting in the tightly bunched leaves. You can ease the problem by taking good care, when hilling up, not to place any soil above the point where the leaves branch out from the stem. An because, as we have said, leeks are heavy feeders, work in a little exra fertilizer every time you hoe soil up. Hardy leeks do not bulb or go dormant in the fall: they just continue growing, steadily if slowly. Harvest is, therefore, largely a matter of choice (of course, if you are really overwintering them, they should not be harvested till well into the following spring). Leeks must, however, be harvested before they send up seed stalks or they will rapidly become unpalatable. And though the emphasis is always on those nicely blanched stalks, do recall that the leaves make excellent (and nutritous) additions to soups and stews. “Summer leeks”, like King Richard, Lancelot, and Lincoln, can last till temperatures get down to 20°F. or so, which, out here, can happen as early as mid-October, but which normally don’t come till well into December (most summer leeks mature about 11 weeks from transplanting—so, if set out in mid-March or thereabouts, they should be ready around the end of May). John Seymour remarks that, while leeks are said to be subject to all the pests and diseases to which onions are liable, he himself never heard of a leek’s being harmed by anything except someone’s pulling it out and eating it. Leeks are members of the Amaryllidaceae (amaryllis) family, and are closely related to onions, chives, and garlic. Although grown as an annual or biennial, they are a true perennial, perennating by means of small lateral growths and often developing a roundish bulb at the base of the main growth. Leeks are common throughout Europe for as far back as we have records of food plants. The Romans called it porrum, a term retained in its present “scientific” name (our modern word “leek” comes from the Anglo-Saxon leac), and believed that the very best leeks came from Egypt, where they had been known in earliest Biblical times: indeed, the Bible states how, during the wanderings of the Israelites in the wilderness, they longed for the onions, leeks, and garlic they had had in Egypt. Nero is reported to have been nicknamed Porrophagus (literally, “leek-eater”) because of his inordinate appetite for leeks, which he apparently thought would improve his voice; Hippocrates prescribed leeks for curing nosebleeds. The Romans were responsible for the spread of leeks throughout Europe and into the British Isles—Chaucer’s storied pilgrims dined on leek soup. By 1775, leeks were being grown in America, by the natives as well as the colonists. The leek is the beloved symbol of Wales; it was displayed as a national emblem as early as 1536, and Shakespeare, in Henry V, mentioned such displays as an ancient custom. And Gallifreans find it useful. You loaded this page on Friday, 19 April 2019, at 16:57 EDT. It was last modified on Wednesday, 30 January 2019, at 20:54 EST.